Rely on RAM Innovative Technologies for your die rebuild needs You can rely on RAM Innovative Technologies for die rebuilds, whether you need to retrofit an existing die set into a new product line, or want to rebuild your die set. Whether a RAM die set, or another manufacturer's die, RAM has the resources to do the job. Our rebuilds are better than new - from incoming materials to final inspection,. Our rigorous Quality Assurance Program adheres to ISO 9000 requirements and utilizes the most advanced techniques and computerized inspection equipment. All procedures and systems adhere to standards that meet military standards as well. We understand the critical nature of your business and we’re equally concerned about downtime and are ready to help keep your systems up and running. When needed, RAM’s specialized technicians — backed by home office engineering support — can be dispatched to your site for prompt emergency service. 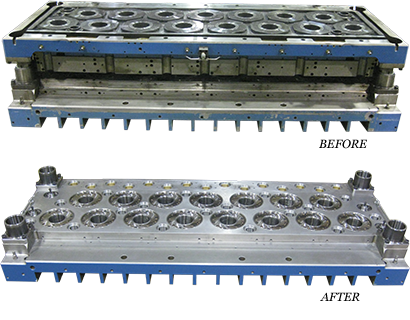 Contact RAM for more information about our die and press rebuild services. Call (330) 904-8039 or email ramgroup@raminnovative.com.